Treating children by putting them in solitary confinement inside a juvenile detention institution, even if they have committed a crime, makes it nearly impossible for them to end up well adjusted, functioning adults when what they learned as children is how to treat the world with the same anger and lack of compassion that was shown them. Any hope of it being a positive experience that could lead to a life of promise is rarely possible. They will never be able to wipe away the childhood years spent doing time in an environment that thinks nothing of treating them inhumanely and with abuse, physical and sexual. The school to prison pipeline, with the intent of keeping the prisons full starts in juvenile detention and it often only takes truancy, an afternoon fight or a childish prank for a child to get sucked into the system. There is little recourse for a parent to keep them out of it, unless of course, you are a parent who has the money to buy their way out. Of course, the children the system goes after are going to be Blacks and minorities, and it is evident by the percentage of different races who find themselves locked up, the majority are going to be Black, then Hispanic and in much, much smaller quantities are White youth. Test scores of 3rd graders are used to determine how many adult beds in prison will be needed, because they determine if a child is not being educated, in schools lacking the money to buy books and hire good teachers, they will turn to crime to make money. Although the very idea of that is sick, it probably isn’t to far off from the truth. There is always money in the state coffers to build brand new prisons and never enough money to provide good schools, since so many of them have been closed or have deteriorated. Enrichment classes like music and art have been eliminated. There are few school nurses or psychologist to help children who need the help. They are written off, they drop out and they are lost. So kids, of all races, are prime targets when they are a little older, for keeping the prisons well stocked with inmates to satisfy the American corporation’s need for cheap prison labor. Plantation slavery never died, it just changed it’s face a little. Inmates, like slaves, are provided with the same substandard housing, clothing, food and medical care. The are brutalized and murdered and the people doing it get away with it. The injustice system is also a pro at splitting up families and shipping them far away making it difficult, and expensive to see them or talk to them on the phone. And it all starts with the kids. Once they end up in juvenile detention, “breaking any rule” can have them put into solitary confinement. Racism from the staff is just as prevalent there as it is in adult prison. Kids they get angry. They fight back. Many are already broken by the life they have had up until that point. If you are a black child, the chance that one of your parents is, or has been in prison is about 50%. There are so many black boys with no father. That was the case for Jamie and his siblings, and now Jamie’s son doesn’t have his father, either. They had a mother who worked two jobs to be able to care for her children. His son’s mother has often worked two jobs to support her children, too. Jamie also had a hard time as a child due to epilepsy which made it hard for him to do things like boys his own age. Many children fight for survival any way they can. Jamie Cummings is the man this blog is about, a man who’s life started in juvy at the age of 16, not because of a crime, but because he defended his mother because a cop, who had previously harassed his family, literally forced his way into their home, after Jamie and his brother had a fight outside the house. Even though the fight was over and they were in the house, and it involved no one else but them, the cop insisted on coming into their home even when his mother said it wasn’t necessary because everything was under control, he pushed his way in, knocked her down and breaking her wrist. In anger, both sons went toward the cop to defend their mother. He maced the older brother, over 18, and Jamie hit the cop with a broom. Is that an offense to go to juvy for? I guess it’s against the law to protect your mother from the man who hurt her because he’s a cop? An ambulance was called for her and she later filed charges and went to court because of his assault on her. I don’t know the outcome of that court appearance. It still didn’t stop the cop from filing assault charges on Jamie and sending this 16 year old to juvenile detention – because they can. They let the older brother go because he didn’t do anything where charges could stick, but a juvenile doesn’t have to commit a crime. There doesn’t have to be a valid reason. That incident started him on the path that led to him not only being able to get a GED in all this time, because you can’t take classes when you are kept in the lowest levels of prison; solitary confinement, ad seg and G5 – all the same thing with different names. Only when you reach the level of G2 can you apply to study for you GED and he only made it to that level for a few weeks until they found a way to send him back to lock up. Guards have a vengance and they can do no wrong. How can you work with no GED and no training? This is what being sent to Juvy 16 years ago has done to him and many, many other youths. They system counts on you coming back to prison through the back door – parole violation. Well, they can’t have him. In juvy it also made him an angry youth, not only sent far away from his family, so no one could visit, but also because he was kept there until he turned 21, not the nine months he was sentenced to. He spent extended stays in solitary confinement that added to the bitterness that led to severe depression. His last institution was in another state and he was sent there because he had given up hope and had sunk into depression. Missing his family was unbearable. He had no support. He gave up. The very day he made it home he visited a friend and while leaving the apartment complex he was stopped by security guards. The police were called and he was taken to jail and they tried to charge him with trespassing. He had really only committed the crime of walking while black. It took 2 days to get him out. He had to go to court. The judge he was in front of was the very person who was his attorney when they locked him up when he was 16. He was let go, but the writing was on the wall. Living in a very prejudiced state, not being able to afford a good attorney, the options are few for young black boys and men. There are plenty of facts to support that. Having no life skills it wasn’t long before he decided to hang with a cousin who had a record and who wanted to hold up a club. He got scared and ran, but people in the club recognized him as being with the man who pulled out a gun and tried to rob the place. Guilty for being there. Black men also get much longer sentences than white men and he ended up in adult prison because of being with the wrong people at the wrong time. He had also met my daughter during this time and they had a baby he has never been able to spend time with. The few times she visited he was behind glass. That boy, who will be 9 in July is his reason for living. His goal to be the father he never had. And he has me, and I’m writing a book that hopefully will provide enough proceeds for him to live on while he decides what to do with his life to create value. Multiply Jamie’s life thousands and thousands of times. Not everyone has someone to help insure his success back into a world that is much changed and very unwelcome. This is the effect of juvenile detention. It needs to be changed. Jamie still sits in prison today. Hopefully it will soon and he will make bail the end of next year. This is why I passionately write this book about his life. “Inside the Forbidden Outside”. Four of the chapters are posted on this site. Fill out the contact form on the bottom to be on the mailing list for more information as it get closer to completion. Juvy destroys our young people. They can’t cope with the things they do to them inside. Yes, there are many youth who have committed serious crimes, usually coming from very dysfunctional families and violent communities. The way they are treated once they get into these institutions makes it unlikely they will go on to to have “normal” lives. Most end up in prison. Many of the crimes committed by youth is because they have no other way of dealing with life as it slaps them across the face. There is little guidance from the adults around them. But the youth are our leaders of tomorrow and we need to handle them with care and nurture them. On the right side of the blog there are many links that will tell you much more about the lives of youth who are locked up and who are in solitary confinement. Until we find a better way of teaching kids how to live their lives, and instill in the value they have as a human being, they will continue to lash out. The adults in their lives disappoint them and don’t teach them the value of respect, for themselves or for others. The link below is a small step in the right direction, and it is only one state. We have to fight for the the children. They are our only hope for the future. They are the leaders of tomorrow whether it is for the right things or the wrong things. 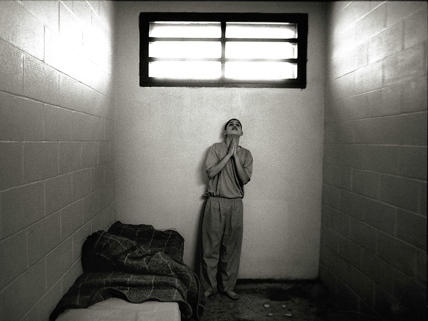 BILL SEEKS TO END SOLITARY CONFINEMENT OF YOUTHS IN CALIFORNIA.